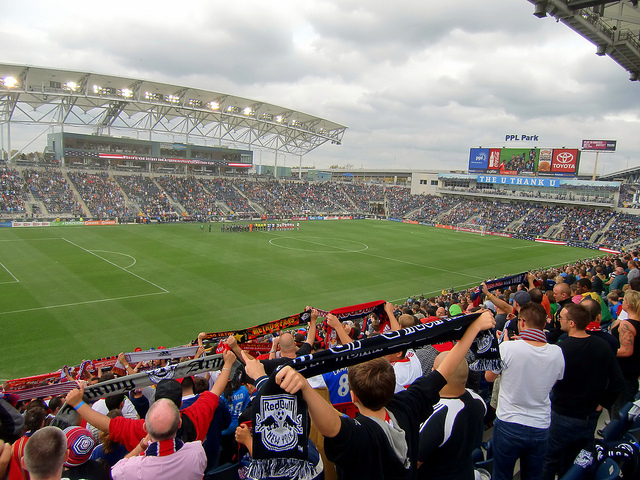 In the final game of the regular season, the New York Red Bulls easily handled the Philadelphia Union. This perfect 3-0 victory, @PPL Park, propelled RBNY into the playoffs proper. If the Red Bulls had not won this one, there was a real possibility of them having to play the dreaded play-in game (on Halloween, no less). Fortunately, that possibility has now been avoided and RBNY will go into the playoffs with some momentum. Two Kenny Cooper goals (once again: Thank you Portland) and one from Thierry Henry added even more misery to Philadelphia's horror of a season. More than the goals, however, it was the rock-solid performance by the RBNY backline that has fans dreaming of MLS Cup glory. Markus 'The Wall' Holgersson saved the Red Bulls several times in this one and Rafa Marquez played his best game of the year for us. Young Connor Lade and DJ Heath Pearce also played a massive part in keeping a clean sheet here. Defensive midfielder Dax McCarty was also a rock and even contributed to the offense, with several magic balls into space. Thank you Philly Union! Bye, bye and we'll see you next year! Please fix your PA system and replace those worn-out banners hanging on the outside of your stadium. The post season looks like this: Our first playoff game will be against DC, this coming Saturday @The Cathedral of Football (8:00pm), with the return leg taking place, @The Lair of The Great Satan, on Wednesday November 7th (8:00pm). History will not be on the Red Bulls side, however, as DC has never lost a playoff series against the MetroBulls. "For large portions of the game, the combined South Ward section was the only thing that could be heard, as dejected Union supporters sulked." I don't think any Philly fans could possibly disagree. Please see the video at top for pre-game and half-time comments. Please click here for our drunken post-game analysis. Please click here for my photo album (slide show here). That's all for now! I hope to see you all this coming Saturday @The Cathedral of Football, Red Bull Arena (built by Makita). The big viper is outta here!